One of the points th at the “WHAT DOES THE BIBLE Really TEACH?” Book makes early in chapter one is the idea that God has a personal name and that if we don’t use that name, then we cannot really know him. In my study with my Witness friend I do not want to challenge him on everything, but I think that this is an important enough issue to get him to think about some things from a different perspective. The Watchtower thinks this is an important issue to because chapter one of the book refers to an appendix where the name of God is discussed in greater detail. Here is the basic gist of our conversation. JW: (Reading from page 13 of the book) If you want someone to get to know you, what might you do? Would you not tell the person your name? Does God have a name? 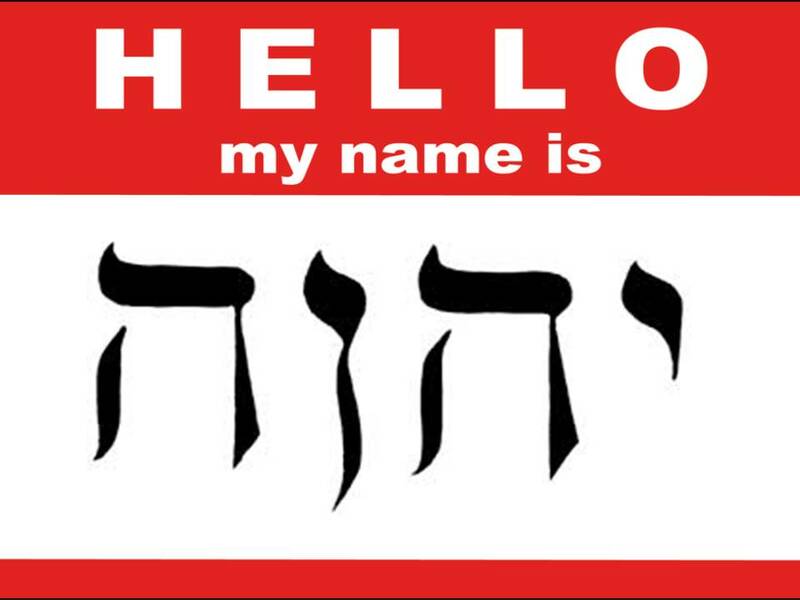 Many religions answer that his name is “God” or “Lord,” but those are not personal names. They are titles, just as “king” and “president” are titles. The Bible teaches that God has many titles. “God” and “Lord” are among them. However, the Bible also teaches that God has a personal name: Jehovah. Psalm 83:18 says: “You, whose name is Jehovah, you alone are the Most High over all the earth.” If your Bible translation does not contain that name, you may want to consult the Appendix on pages 195-7 of this book to learn why that is so. The truth is that God’s name appears thousands of times in ancient Bible manuscripts. So Jehovah wants you to know his name and to use it. In a sense, he is using the Bible to introduce himself to you. KW: I read this whole chapter already and the appendix too. I don’t agree with the idea that it is impossible for me to know someone unless I know their name. KW: Let’s take my kids for instance. It was years before they even realized that I had a first name. Surely, no one would suggest that my own kids didn’t know me until they learned my name? This chapter says that terms like “God” or “Lord” are impersonal titles, but my kids call me by a title that is more personal than my own name. They call me Daddy. Anyone who knows my name can call me by it, but there are only three people on this entire planet who have the right to call me Daddy. Plus, I think that they idea that God has a “name” means something much more than just using a certain pronunciation. KW: I think God is much more concerned about his reputation than whether or not I use a specific English pronunciation to a German word transliterated from the Latin which is based off of the Hebrew. Who He is is much more important that what we call Him. JW: Let’s look at Jeremiah 23:26-27. It reads, “How long will it exist in the heart of the prophets who are prophesying the falsehood and who are prophets of the trickiness of their own heart? They are thinking of making my people forget my name by means of their dreams that they keep relating each one to the other, just as their fathers forgot my name by means of Ba′al. You see, God doesn’t want people to forget his name. KW: Right, but you are already assuming that this is referring to a specific pronunciation. Do you know anything about logic? JW: Well, I’m no Spock, but I hope I understand some of it. KW: There is a logical fallacy called “Begging the Question.” Basically, it is assuming the conclusion within the proposition. The first time I remember encountering it was when I was in the 8th or 9th grade. My science teacher was discussing the fossil record and said that certain strata were 100,000-500,000 years old. I asked how he knew those layers were that old. He answered that we could tell the age of the layer by determining the age of the fossils found within that layer. I asked how we could know the age of the fossils. He answered that we could know the age of the fossils because they are found within layer known to be a certain age. I didn’t know what the argument was called at the time, but I remember blurting out in class, “You can’t do that!” He was using circular reasoning to prove a point. That is what I think you are doing here in this instance with Jeremiah 23. You have already assumed God is referring to a specific pronunciation to what you believe is God’s personal name. JW: But it clearly says that He doesn’t want us to forget His name? One of my witnessing techniques is to look at a verse or statement and change a word or a phrase so we can see more clearly what it is saying by contrasting it with what it is not saying. For instance, I could quote John 14:6 this way to prove a point. “Jesus said, ‘I am the way, the truth and the life and no one comes to the Father except through the Watchtower.’” Uh. No. Jesus said no one comes to the Father except through Him. I decided to use this technique with my Jehovah’s Witness friend. KW: Do you see the difference? Doesn’t it sound much more important that people remember who God is rather than what they call Him? I think God is more concerned about His reputation that a certain pronunciation. KW: Exactly. When someone asks a question about identity, they want to know more than just a name. Pharaoh wanted to know by what authority God can command a man who thinks he is a god. For instance, if God answered Moses and said, “My name is Chuck,” would that really tell him anything? Can you imagine this? Moses goes back to the people of Israel and says, “God has sent me to you to rescue you from slavery.” They people ask, “Who is your God?” and Moses answers, “His name is Chuck!” Does that help at all? Without a reputation, a name is nothing. JW: Let’s read Joel 2:32. “And it must occur that everyone who calls on the name of Jehovah will get away safe; for in Mount Zion and in Jerusalem there will prove to be the escaped ones, just as Jehovah has said, and in among the survivors, whom Jehovah is calling.” If we were to substitute “reputation” for the word “name,” it wouldn’t make sense. KW: It does to me. To call upon God’s name is to call upon His character. I am calling upon who God is to save me. The word “name” means more than a pronunciation. It also includes a reputation. I think that a reputation is much more important that a pronunciation otherwise the literature we are using wouldn’t use an English pronunciation of a Hebrew word. JW: But the fact that the name has been revealed means we should use it. KW: That’s fine and I use it, but I don’t think my salvation depends whether or not I use it. JW: We just read it. KW: Really? I did a study. You’ll be proud of me. I went to the Watchtower web site and looked at every instance where the word “name” is used in the book of Acts. It is used 39 times. Three times in reference to Jehovah, 32 times in reference to Jesus and four times in reference to other people. I just copied and pasted the verses onto this word document here for you. Obviously we can’t go through all of these right now so I made an extra copy for you. JW: We could just look at and stop at the first one. This one is a quotation of Joel 2:32. It refers to Jehovah. KW: That is not everything the rest of the book say though. JW: This is the emphasis. KW: Ok, then look at Acts 4:12. What name is that referring to? KW: Whose name does this verse refer to? KW: Is that a contradiction? KW: It says no other name. There is only one name by which we can be saved. So which name is more important? At this point my Witness friend went into damage control. He was trying to explain how Jehovah sent Jesus to be a ransom for us and that without Jehovah sending Jesus, we could not be saved. He was trying to place more emphasis and importance on Jehovah. KW: When you looked at Acts 2:21, you wanted to stop there and use this verse to prove that I need to use the name Jehovah to be saved. Had we started at Acts 4:12, I could have used the same argument. Since it says there are no other names by which we can be saved, I could make the case that this includes the name Jehovah. We are not saved through the name of Jehovah, but only through the name of Jesus. My Witness friend then made a statement that was somewhat surprising. I understand why he said what he said next, but it is not the direction I wanted to go at this point. Still, I thought it was interesting that this thought jumped into his mind. JW: That is another subject that is still open. There are many other verses to prove that Jesus and Jehovah are not the same person. I was pleased that he put this thought together. He concluded that if the Bible says that we need to call upon Jehovah to be saved, yet the Bible also says that the only name we can call on for salvation is the name of Jesus, then it is safe to conclude that Jesus is Jehovah. Let’s just say that is not a comfortable thought for him. KW: That isn’t my point. I am just trying to show you that the book of Acts says a lot more than just stopping at Acts 2:21. We concluded our study and I gave him his copy of my study. I purposefully didn’t want to go through all of the verses with him because I want him to have time alone to really look at it and let God work on his heart when he doesn’t have his defenses up against me. If you would like to see my list of verses, you can see it on our web site here. Editorial Note: I once did a presentation at the Witnesses Now for Jesus Convention titled, “What’s in a Name- Pronunciation or Reputation?” Much of what I stated here was born out of research from preparing that presentation. For a much more in-depth look at God’s “name,” please click the above link. Very good confutation on the ‘divine’ name. not a Jehovah’s Witness ? The answer to that question is found in the New Testament. of the early church , it was the simple message of who Jesus was and what He had done. the people who called upon the name of the Lord and upon whom His name was called. the footsteps of the Christian witnesses of the Bible a person must be a witness of Jesus. ” Jehovah’s ” witnesses . arrangement now —-Matt 11:28 .
for themselves , and which they then can personally, individually , embrace . God bless you Keith in your labor of love to reach Jw’s for Jesus . Notice the context where Jesus is the only name “under* Heaven” by which we are saved. As God’s Word and chief representative, the sacrifical ‘covering’ and adoptive father of the human race. I wonder how you view Rev 1:1 which makes a clear and unmistakeable distinction between God and Jesus. Please before you try to make a different point than the one I have raised, I would appreciate an answer to it. Thanks for your comment, but you have missed the point. This post isn’t about whether or not the Father and Son are distinct from each other. It is about what it means for God to have a name. I meant to include in the blog post a presentation I did a number of years ago titled, “What’s in Name- Pronunciation or Reputation? I will include it at the bottom of my original post. Getting back to the subject. It makes no difference that Acts 4:12 states there is no other name *under* heaven by which we can be saved. If we are to be saved through the name of Jehovah, then that name would have to be *under* heaven and given among men too. The “name” we are saved by is the reputation and authority of Jehovah in Acts 2:21 and the reputation and authority of Jesus in Acts 4:12. Great job keith! And how observant of you and patient to see that he made that association (Jesus is Jehovah) and didnt push it. Your giving him time to think on his own and letting the word of God do the work for you! Brother, I wish you could do a massive convention on how to witness to Jehovah’s Witnesses. IMHO your approaches are the best bar none including Lingle’s books suggestions because you give room for the Holy Spirit and allow them to draw conclusions by being a patient guide! Terrific! High compliments. I’m not sure I deserve them, but I do appreciate them. I’ve learned a lot from other people, including Lingle. I put it all together in a way which seems to work for me. calling God ” Jehovah ” ? That appears like his reasoning . It appears that the name ” Jehovah ” has only been around since the 14th century A.D. Him JHVH / YHWH or , Yah-weh , rather than “Jehovah ” . Here we have a text that says the name of Jesus IN THEIR TRANSLATION bro, is above EVERY name named. The minute you name a name Jehovah whatever it is above it but not only NOW but in the world to come! Had to drop those on ya bro! Thanks i am enjoying reading these greatly! Whoa. Ephesians 1:21 is powerful. Thanks for the tip. Keith, just my little penny to the conversation. If there is only one God in the whole universe, than He doesn’t even need a name. We are given names so that we can be identified and differentiated from one another…you are Keith and I’m Slavik. Humans named animal species and plants so that we know what we are talking about. If I would be the only human on the face of the earth, would I even need a name? No, because I don’t need to be distinguished…I’m the only one. JW are trying to use an approximate name as a quintessential part of their teaching. Even claiming that they restored God’s name, while in the same time acknowledging that they don’t know what was the exact pronunciation…paradox. To me trying to fit The All Mighty God into a name is trying to bring him down to our level, or trying to put Him on the same level as false gods…because now we need to distinguish Him from false gods by using a name. But great is God’s love and mercy. He lowered Himself to our level…without our help…became a human and revealed Himself in Jesus Christ. My belief is that’s why God allowed the Old Testament name to basically disappear, so that the New Testament name, Jesus Christ, be exalted. I hope God will grow some good fruit in the hearts of your JW friends from the seeds you planted. Keep the good work. God Bless! Good points. Thanks for your comment.